Her attempt to find work in New York city as a graduate was not only intimidating and overwhelming but also had contributed to a condition that led her to temporarily give up her artistic aspirations. It was through her work at the Storefront for Art and Architecture — a non-profit organization which provided a “laboratory” of artists, culture critics, scientists and other imaginative and intellectually gifted for innovative cooperation — that had provided her with the type of education she needed. Shirin argued that the traditional education found in most art schools mistakenly attempts to “detect” the talent in each person and develop each one into a style and if perfected to an extent that they are ready to “enter the galleries and museums” and being their professional careers. The Storefront for Art and Architecture had given her an entirely different approach. It was at the Storefront that she was able to develop her own identity needed for research, the process of discovery, creativity and the ability to find meaning in art. It as however not until her trip back to Iran a decade later in 1990 that she would find her subject matter and focus. It was in Iran that she was unable to find an approach or a form of expressing what she was experiencing when she developed her own methodology and began pursuing her own professional work. Shirin argued that where the art school had taught her faithfulness to mediums of expression and their perfection, her own work was however pulling her in unfaithful ways to any them. Her own work became a reflection of her own personality, embodying her familiarity and desire for the “transitional” and “nomadic” behavior. Her work as an artist has since ranged from photography to video to cinema and some performance art. Each form has however delved into the different aspects of the personal, the poetic and the political as a way to delve deep into her own “personal and social anxieties”. 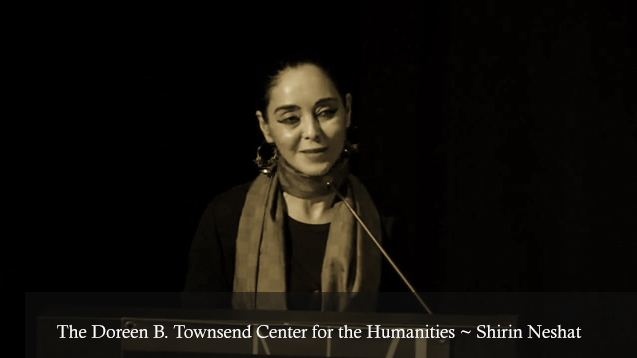 ** To learn more about Shirin Neshat, please also consider the following webpage on Artsy here.